You’ve heard it before, but be sure you are brushing twice a day and flossing once a day. 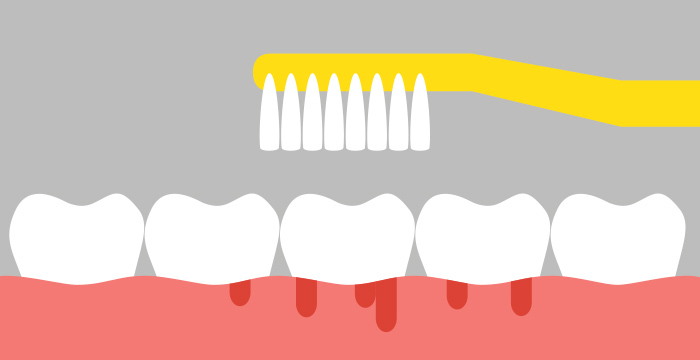 Keep the goal in mind to remove plaque quickly and efficiently. Why? Because the longer plaque sticks around, the more likely it will cause inflammation and bleeding, which can then progress to advanced forms of gum disease. So if you still see visible plaque and swollen gums, you may want increase brushing frequency to three times a day or after every meal. When brushing, use circular motions that are gentle on your teeth and gums. If you find yourself brushing hard or vigorously, you could actually irritate your gums and contribute to bleeding and swelling. Want to really analyze your form? Check your brushing technique here. The ADA recommends using a toothbrush with soft bristles as hard bristles can bother your gums. You may also want to upgrade your manual toothbrush to an electric toothbrush. Electric toothbrushes can create powerful cleaning movements up to several thousand movements per minute versus a few hundred with manual brushing. Is an electric right for you? Read more here. What you eat can play a huge role on your oral health as bacteria thrives in sugary environments. Your best bet is to eat sugar in moderation and brush or rinse immediately after consumption. Keep in mind that eating a balanced diet can lower your risk of gum disease and oral issues. Smoking can cause serious problems for teeth and gums, including severe gum disease. However, not all smokers will have bleeding gums, so this shouldn’t imply one doesn’t have gum disease. Read more about the dangers smoking has on oral health here.